Reunions are all about making memories. For Filipino families, a lot of these memories come from the food served that day. Ever notice that along with photos of nephews and nieces, there are also photos of the food? One way to make a really delicious memory that's picture-perfect is to bring a dessert made to WOW. Store-bought cakes and bowls of fruits are usually the top options for reunion desserts. 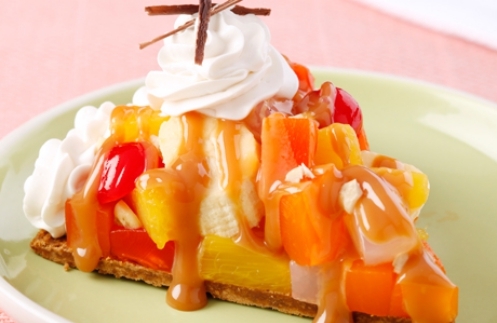 Easily put those two ideas together and present something with “oomph” by using the Fiesta Dulce de Leche Pie recipe. Not a toffee pro? No problem. All this recipe really needs are a few ingredients and a bit of time over the stove! Ice cream cakes aren't new—but a homemade one has wow factor that will get you pats on the back for the effort. Try the Gelato Blast—different layers of ice cream, marshmallows and fruits in between, and a nutty torte-like crust. Just buy some ice cream, mix, and pop in the freezer. Make your own chocolate with the easy-to-follow Choco Truffles with a surprising fruit center. No expert chocolatier skills needed, just imagination to think of all the different centers you can put in the truffles. Make this dessert extra memorable by building a tower of truffles by simply layering the goodies in a circular plate. Use extra melted chocolate as the “glue” that holds the truffle building blocks together. You don't need to be a trained pastry chef to make memorable desserts in your own kitchen. These may take a little more effort than your store-bought alternatives, but the result will surely be talked about for reunions to come.